"I spend my days watching Ben and Jane become a couple, and I will myself to happiness. I make myself a scientist of them, an expert in my narrow field, a Ben-and-Jane-ologist. How close can I get without compromising my subject? Move closer, a little closer." I think we may need to agree to disagree! 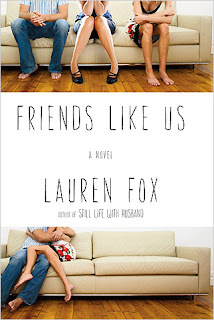 Today I'm taking part in a small group discussion about the book Friends Like Us by Lauren Fox, with Belinda from BookBelle and Brooke from Books Distilled. Please stop by BookBelle to see what we have to say about Friends Like Us. I guess friends do this all the time, analyze the love relationships among their group. Sounds like a good book to discuss. Must check this out! Thanks for letting me know! I was surprised by the depth this one had - I had really been expecting utter fluff. There was certainly some of that but Fox made the relationship and its complications very believable.